Dual purpose: can be plugged in or used with a 12v battery. This unit is ideal for large and medium sized farms away from the public. Can be used with a remote/fault finder to make working on fences more efficient, but remote is not included. Batteries sold separately. Can be controlled with a remote control (see under accessories tab below) but sold separately. A 110v AC electric fence energizer used to keep out deer, raccoons and rabbits from garden/orchard areas. It is also used to keep in poultry, cattle, sheep, goats and guard dogs. Effective at protecting against coyotes, stray dogs, bear and fox. 6.89 joules in moist soils. .60 joules in dry soils. Requires 36 ft of ground rod (To order, see accessories tab above.) in the ground. Includes a battery lead set. Has a 110v plug on a 5' cord. Draws 11 watts per hour. Draws 1100 mA per hour on the fast setting and 600 mA per hour on the slow setting. Use a 90-120 watt solar panel. Will last 2.5* days when set to the fast pulse and 4* days when set to the slow pulse. *Assumes being drawn down to 40% between recharges. Indicator lights show output voltage and battery condition. Backlit LCD screen displays output voltage, battery voltage and earth voltage. Fast pulse at night and slow during the day. Use for nocturnal livestock and predators or when visitors are more likely to be around. Slow at night and fast during the day. Use when pressure is higher during the day than at night (diurnal livestock). Fast setting- Pulse rate is approximately 1.5 seconds. Use when animal pressure is great and where no visitors may contact the fence. 40 pulses per minute. Can be controlled with a remote control (see under accessories tab above) but sold separately. 20 of the 164' poultry nets. Low-impedance units work effectively with high weed/grass loads, but not as well with dry soils or poor conductors. Safe to use with all polywires, polyropes, tapes and electrified nets. Modular so it can be easily repaired. Mount the energizer at desired location, inside, away from risk of fire. Plug into outlet and test fence with a fence tester. Make sure the energizer is turned off before working on the fence or the energizer. 3 in 1 tester for fence voltage, intensity of current and fault finder. Indicates which direction a fault (leak) in your fence is located. Use with Speedrite 6000, 6000i, 12000i and 18000i units to run on 110v AC power. 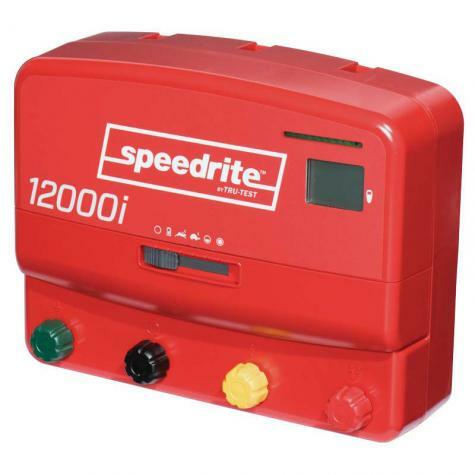 Battery leads for Speedrite electric fence energizers. Allow the Unigizer series to use battery power. Very wet spring in Missouri, having problems keeping miles of sheep fence hot. Replaced a 10j unit with this 12j and immediately had an increase in voltage BUT far more important to me, this charged was able to 'brown off' leaves FAR better.